What happens when your cat eats Oriental Lilly or Oleander | A Cat Called Freya, and Teego Too! ← Larry the tabby causes U-Turn at heart of British Government! Teego was rushed to the emergency vet today! Ok, very bad daddycat here. This afternoon, I came home, and noticed Teego had a very funny yellow mouth, as if he’d been eating something he shouldn’t have. To my horror I realised! He must have eaten a lilly (oleander) that I’d been given a few days earlier, but it was only a bud, and it must have opened up in the morning! I called the Vets and they said I ought to bring him in for a check over. He seemed fine, and unbothered, but he had vomited 3 times so I was hopeful that he’d got rid of anything in his stomach. I looked at the lilly, and saw that only two of the pollen covered stamens were missing, and I’d found a chewed one on the floor that I’m guessing he’d spat out. I cut off the remaining flower and put it in a container to take with us to the vets. 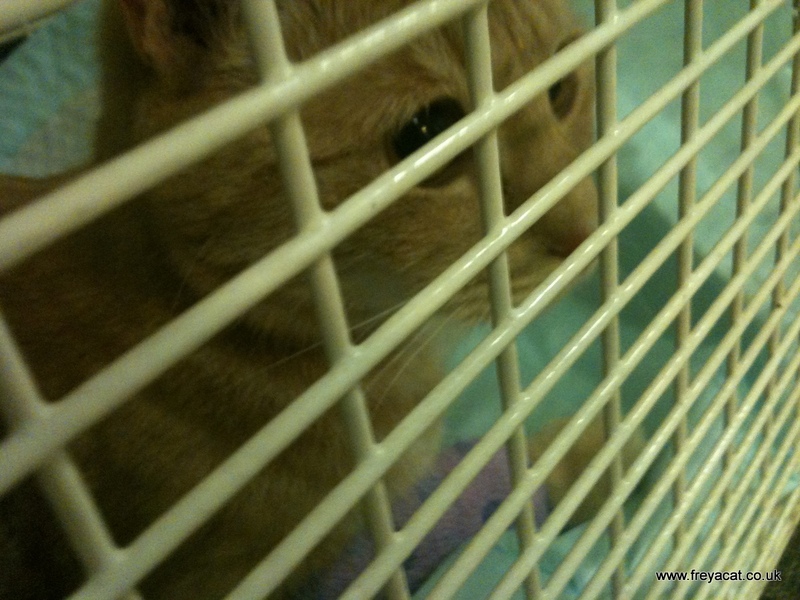 After arriving at the Vets, we saw Jesse Davicioni, a nice vet we’ve seen before, and he knows Freya and Teego… He was very calming to a panicky Daddycat, and explained what we would have to do. Lillys are very poisonous to cats, but the symptoms can take a day or so to manifest, so his advice was to take Teego to the Animal hospital about 30 minutes drive away. Teego feeling sorry for himself after vomiting. Also, Jesse the nice Vet put a catheter in Teegos arm, and gave me a package of saline drip and some more activated charcoal to give to the Animal Hospital so that everything was all ready when he got there. Mommacat then joined us to take Teego to the hospital. When we arrived, there was a lovely Nurse there that was really concerned for Teego’s welfare, and that put our minds at rest too. Daddycat held Teego so that she could get the drip in, and Teego was a very good and brave boy. All the time since arriving the Vets, he didn’t cry out or struggle once! 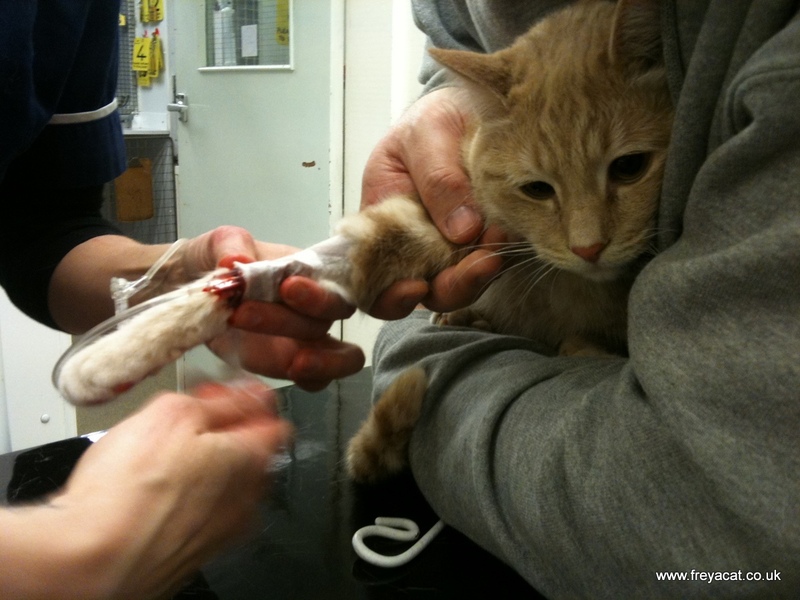 But I think the tape on his furs bothered him, and he struggled a bit when the catheter was being connected, which resulted in a bit of Teego blood being spilt. It was pretty tough watching my baby kitten bleed, but I was happy he was in good hands, so I didn’t freak out or anything, and besides – I didn’t have time to freak out – I was too busy holding Teego’s arm still! Eventually, The drip was all in place, and Teego was sporting a rather fetching purple bandage! Finally, Teego went to his hotel room for the night, with his drip in place settled down, and as we were finally leaving, his eyes were starting to droop. Oriental Lillies or Oleanders are DEADLY poisonous to cats. They are beautiful to look at, but just not worth the risk. We’ve had them before, and neither cat has shown any interest, but it just needs one munch for a whole lot of heartache and expense. As soon as Teego got to the Vet, he induced vomiting, and gave activated charcoal liquid to absorb the toxins. Then Teego went to the hospital, and was put on a saline drip to flush out any remaining toxins. 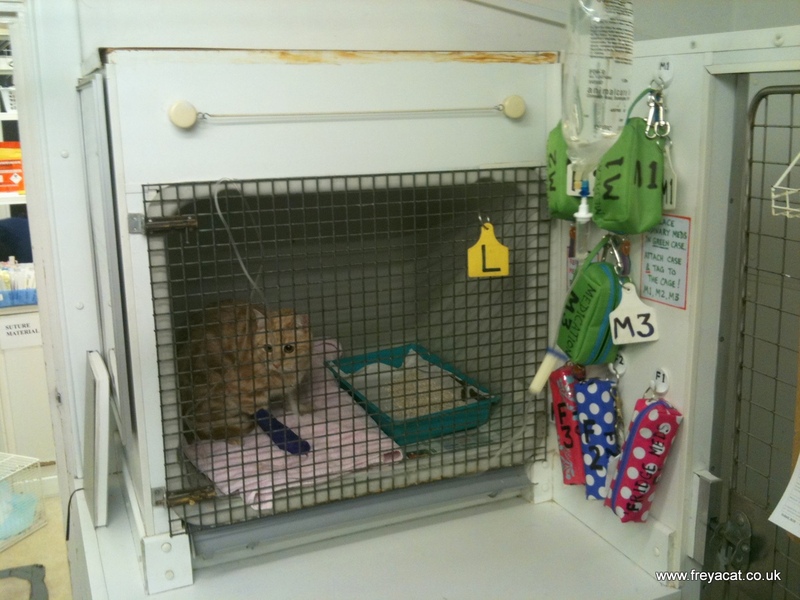 He’ll be monitored regularly and if anything happens, the emergency on-call vet will be called. He’ll get some more activated charcoal in the night to absorb anything else that it can. In the morning, he’ll go back to Jessie our vet, and spend another 24 hours in their care, with less monitoring, but a blood test later to look for any liver or kidney problems. Fortunately Teego has RSPCA Gold Insurance so all costs should be covered. That’s a big weight off our minds at such a difficult time. Next thing is I call the hospital at 08:30AM to check everything is OK. Of course if anything happens, they’ll call me straight away, but we have tremendous faith that this will all be a big waste of time and money. He’s young, strong, and showing no signs of poisoning so far. I’ll let you know in the morning how he goes. Paws crossed for the little chap. 44 comments to Teego was rushed to the emergency vet today! I am sorry to hear about Teego but glad you discovered it in time and he will be in purrfect shape in no time! I will be looking forward in getting knowing you and your furbabies as well. Keeping Teego (and Daddycat and Mommacat as well!) in my thoughts and paws crossed that all will be well. Hi Teego, my name’s Henry and although I’m a human I’ve only just been born (I had a very busy Saturday) and so am learning lots of lessons like what I should/shouldn’t put in my mouth. Just wanted to drop you a line between sleeps to wish you all the best, my cat Splodge sends his regards too. Oh my, we’re all sending purrs your way sweet Teego, please feel better soon! 13 HUGE purrs coming Teego’s way…poor silly little guy. we’re hoping all will be well tomorrow and he’s no worse for the wear. P.S. Our mom STILL feels guilty. poor sweetie! Purrs to you Teego!! Oh Teego! We are all purring for you! We are purring very loudly for Teego and the family! aw Teego! we will purr for you! sweet lil one. it sounds like you are being well taken care of and many are watching over you!!! My heart was in my mouth when I read what Teego had been into! I am so glad you knew the dangers of oleanders and rushed him to the vet right away. I am purring that he will be all right – in fact, I am pretty sure he will be since you acted so quickly. But what a scare! So glad to hear Teego’s under such good care. As Patti said, ALL lilies are poisonous (especially the pollen) and we now don’t keeep any plants where the cats can touch. We’ll occasionally get them some kitty grass but all they tend to do is sick it up! Tell Freya to keep her paws crossed too. O, we’s so sorry to hear about Teego. Him looks so scared in tha photos. But him’s a brave brave boy. So glad him’s Dad knew to react fast and get hims to tha vet. Mine Mom ML will not allow any plants in tha house excepting kitty grass. I am so sorry that Teego got into the oleander. Lucky you caught it so soon. I am praying and Herman is purring that he will be fine. Oh Teego that’s such a close call young man! We hope you are doing ok and there’s no sign of any damage. You are very lucky to have gotten to the vet so quickly. Sending you big rumbly purrs and some for your Mum and Dad too as they probably need them also! Teego, it makes me feel so sad to see you sick and looking so skerred. Harley and I are purring our very best that you are all better and get to come home soon. Thank goodness your dad acted quickly! This is a good warning for all of us kitties. Oh, no, Teego! We’re sending you our loudest purrs that everything will be well. Paws crossed that you’ll be home soon. Kitty kisses to you and hugs to your humans, who of course are so worried. We’re glad your dad acted quickly! Oh, poor Teego! He really looks frightened — his eyes are so big and round. Teego, we are purring for you until we hear you are well. Next time, remember NOT to eat anything that is not your regular food, sweetie. It’s just not worth the risk. oh my goodness i am so sorry to hear this! so glad you found him and acted quickly! THANKS DADDYCAT! Purrs and head bonks to Teego. Good job Daddycat, you acted quickly and helped your boy! 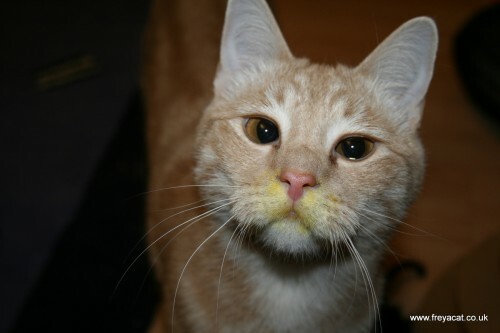 We are so glad that Daddycat noticed Teego’s yellow mouth! Our meowmie won’t even keep house plants because she doesn’t trust us! We are purring for a speedy recovery for Teego. He is very handsome! Hope Teego is OK! Glad to hear everyone caught it in time. Very scary! I also had to give up houseplants, even safe ones, because I have a wild one who loves to munch on them. They get cat grass and catnip sometimes, but no permanent ornamental plants anymore. We are putting pur purr motors into hyperdrive! We hope that your pawrents have gotten some good news on how you are going and we hope you are home soon. That is so scary! 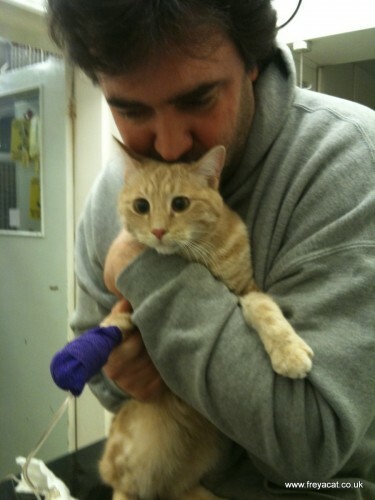 We are certainly glad that Daddycat caught this early, and that it looks as though Teego will be okay. What a frightening ordeal, but it sounds as though the sweet boy is in very good hands now. We are sending our best purrs and prayers for you all. We are purring and purraying for Teego to be okay. That’s why we don’t have plants either, our Momma knows we would try to eat them. Get well quickly, sweet boy! oh Teego, we is purring very hard for you. We’ll purr loud and hard for Teego. Sending purrs to Teego today…hope everything turns out ok, and he’ll be home before you know it! oh no! thank goodness you noticed it quickly and got him to the vet! hopefully everything is ok now! The cat i have now shows no interest in the 3 little plants i have above my sink.. she never gets up there anyway.. but my cats are the reason i almost never have flowers or plants in the house. And thank heavens for pet insurance! how much do you pay a month if you dont mind me asking?? i looked into getting it before but now that Lucy is getting older (shes 6 or 7 years old now) im really thinking more about getting it within the next year or so. Hopefully she lives many many more healthy happy years, but I want to have it just in case I need it. Vet bills are SO expensive anymore! even for just regular check ups! I’m afraid I can’t remember exactly, but it’s around £6-8 a month, and it’s RSPCA Gold insurance. Teego never showed any interest before either, so be real careful! Aw, poor Teego!! We are purring for him and we hope he will be okay!! Man what a shock that must have been! Glad Tego is OK. We saw you on the CB and thought we’d say hi. HI! Oh my Goodness Teego, how scary! We will purr he will be ok, and no damage at all has been done. Little Teego dear, no more nom-noms from anywhere but from your food plate, ok? Teego, we’re purrin’ bigtime for you to feel like yourself again. And, when you get better, don’t ever chew anything like that again! We hope that Teego will recover fully with no damage to his liver or kidneys. Our thoughts are with you and the girls are sending you all purrs and headbutts. 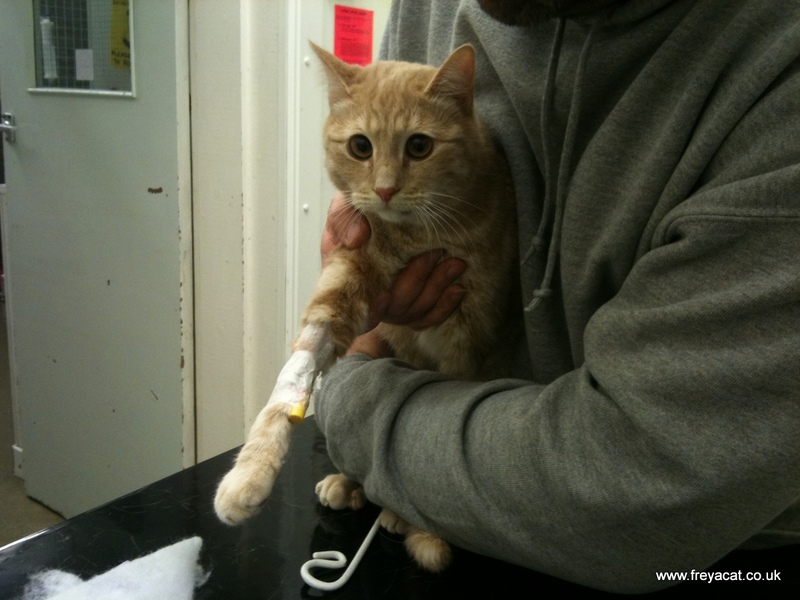 Tips about Pet Insurance | A Cat Called Freya, and Teego Too! Update on Teego's visit tot the vet for eating deadly poisonous Lilly/Oleander | A Cat Called Freya, and Teego Too!